Our arid lands are chock-full of potential for stirring moments and connections with nature even a casual visitor can enjoy. Witnessing the confetti of spring’s wildflower celebration, a feeding frenzy of nighthawks rising to a boil on a July evening or golden flecks of lichen illuminating the basalt on the edges of daylight are certainly a few. Personally, there is one standout that never grows old: the plunge off the Waterville Plateau into the yawning weather-chapped maw of Moses Coulee. Related Content: What is a Coulee? Down on the coulee floor, the change of landscape is dramatic. This mile-wide, box-shaped valley is a stark contrast to the gentle swells of wheat on the plateau above. Here, a shaggy shawl of sage and steppe softens crumbled earth, 500-foot walls protest the horizon and miles of stony pipe organs once reverberated with this landscape’s cataclysmic origin: ice-age floods. Fool's gold lichen in the coulee scree. While the raw cut of the coulee is undoubtedly the geologic showstopper, there are other subtle signs of this gargantuan flood event as well — but you have to know where to look. If you’re cruising toward Banks Lake during a 60-mile-per-hour ascent of the coulee’s east wall, you’ve likely missed it. We all recognize names like Yosemite, Rainier, Yellowstone and Everglades, exalted as they are in their National Park status. But did you know there are nearly 600 additional celebrated sites that largely reside outside public consciousness? These places are scattered all across the country on public and private lands, and one of them lies in the heart of the coulee, its extended paunch belted by state Highway 2. It's "The Great Gravel Bar of Moses Coulee." Laurie Jenkins (center) explains the Great Gravel Bar's formation. The Great Gravel Bar is a 3.2-mile-long pendant bar stretching along the coulee’s western boundary. Caught on the leeward side of a large block of protruding basalt, weakening floodwaters showered the coulee’s floor here with an enormous storm of pebble and cobble 240 feet deep. It’s easy to overlook this bar that masquerades as a suit of shrub-steppe, but it is likely the largest example of ice-age-flood-related bars across the channeled scablands. 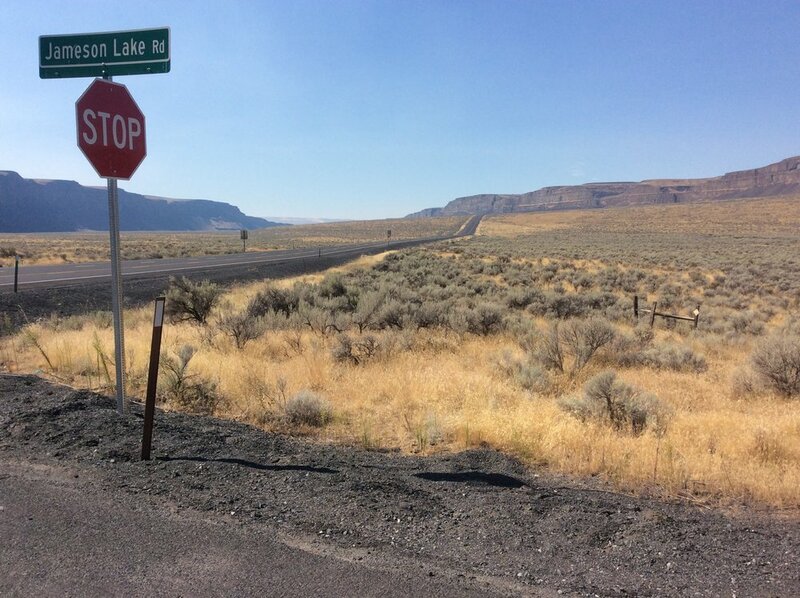 Like the scars of Grand Coulee, Dry Falls and Moses Coulee, the Great Gravel Bar is a testament to the unfathomable walls of water that incised and characterized our patch of Washington epochs ago. But for this steward, it’s something more. Highway 2 (background) rises off the coulee floor to climb the Great Gravel Bar. In this age, where our attention spans are increasingly being cut to the quick, it’s customary to dismiss the inconspicuous. Only the most beautiful and braggadocious of spectacles and voices, seem capable of being seen or heard, and sagebrush and gravel bars don’t often fit this bill. Thankfully, The National Park Service reacquainted me with an important lesson learned back in The Great Plains: There’s substance in subtlety. It pays to slow down, get out and take the time to explore and connect with the land (and waters) around you. All of nature is full of unseen splendor and incredible stories just lying in wait to inspire. Take the initiative in finding the hidden gems, and you will be rewarded. The Two-Minute Takeaway: What is a Coulee?